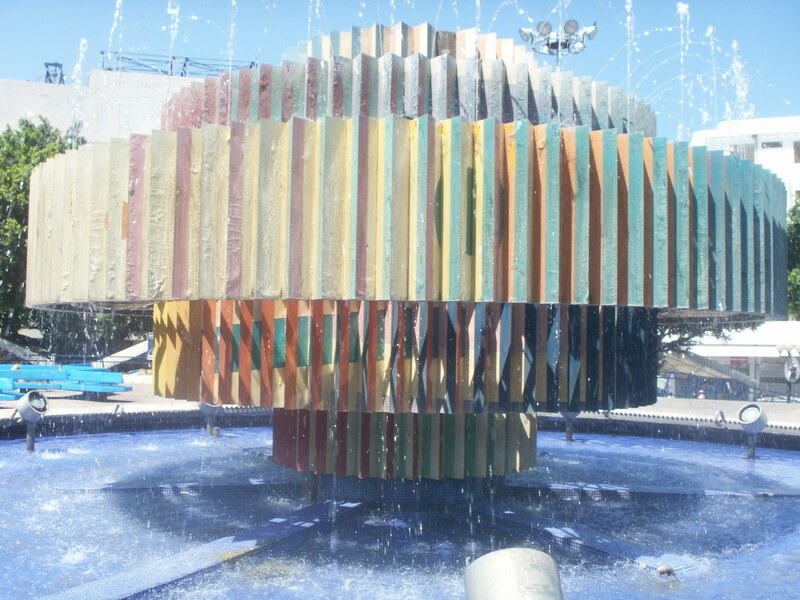 There are things that we just adore about fabulous, fun, cosmopolitan Tel Aviv. Of course, there’s also a few things that drive us crazy. Let’s examine how to manage the good and the bad to have a wonderful time in Israel. Tel Aviv is modern and international, nothing like Jerusalem. Nothing will ever match the magical city of Jerusalem because it’s a one-off. I’m sorry to inform Tel Aviv, Paris, Tokyo and Sydney but a spiritual place such as Jerusalem has no competition from any other place on earth. 1) Beaches! Tel Aviv’s beaches are pretty clean with golden sand and deep blue water. The most appealing thing about this beach for me is the atmosphere: you get yourself some henna body art; play a game of Maktot – an Israeli beach game like tennis or paddleball, visit the busy man selling artik ice-creams, snack on some schnitzel strips, find a new love, make some friends and even have a swim. It’s nice to see such a social beach scene. The water was freezing in April but, as it was such a hot day, you can defrost in a few minutes. 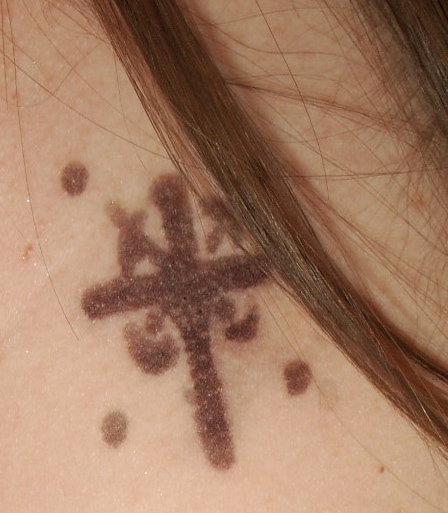 I got a henna cross as I was in the Holy Land for Easter. 2) A day trip to Caesarea is one you will never forget – It’s not everyday that one gets to visit Herod the Great’s pleasure city with all it’s baths and the houses of St. Paul and Pontius Pilate! This beautiful city, built to Herod’s specifications and within his vision of making Caesarea the finest city in the world, was established in 22 AD. 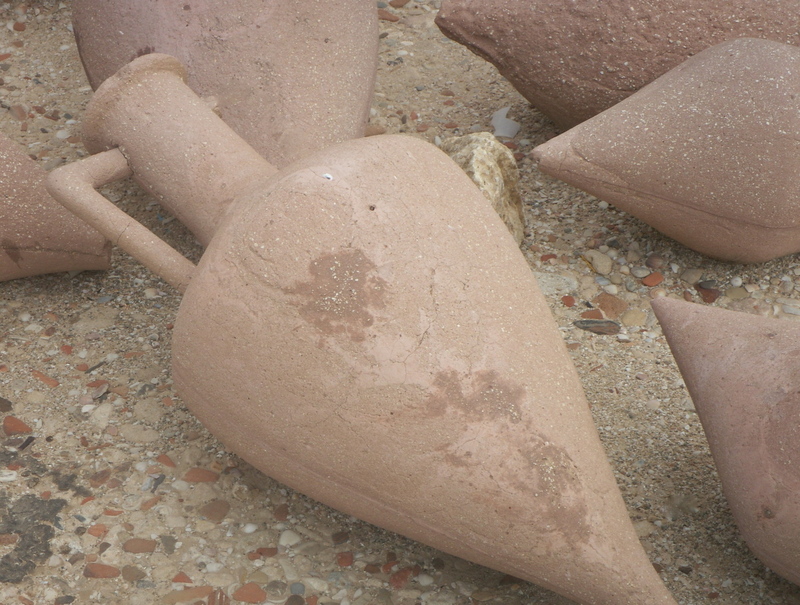 The town fell into disrepair over the last 2000 years but is now Israel’s biggest Archeological excavation site. The mosaics are stunning and the old amphitheatre has been restored to be used for concerts – I think it’s just wonderful that an amazing place like Caesaria can be enjoyed again in these times. Perhaps it’s because it’s such a beautiful and magical place that Caesarea is also home to the affluent once again, with luxurious villas along the coast, I guess it’s not just Herod who recognised the beauty of this area as it’s prime real estate once again. 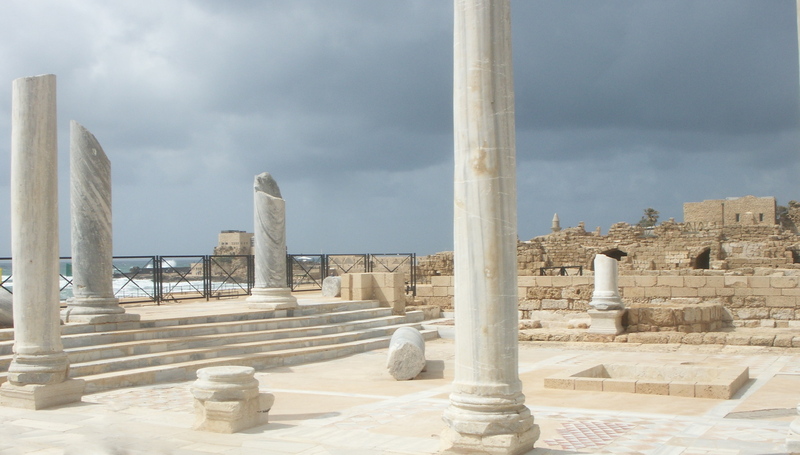 Caesarea is very close to Tel Aviv – 45 minutes drive. If you get one of the many buses to Khadera you can change there and get the 76 bus to Caeserea but it involves a long walk from the bus stop so drive if you can. 3) Israeli restaurants are ubiquitous, very good, very cheap and serve very big portions… I was very impressed! There is all sorts of Middle Eastern, Russian, Indian and American influences that can be found in Israeli cuisine but I usually ate at the Misada Mizrahit which are local places found all over Tel Aviv. They usually serve the same fare: Meze, which consists of several small bowls of dips,carrot and potato salads and then pita with some kind of grilled meat (often skewered) with chips and a dessert – it’s simple but you can’t go wrong at these restaurants. Nana Restaurant is a very nice bar/restuarant in Neveh Tzedek which is very magical in the evenings with its garden courtyard and antique furniture. Nana is not really the place for vegetarians, although there is fish on the menu. I think the signature dish is the lamb. It’s a great place but everyone seems to complain about the service – they are pretty rude but I would go back anyway. 4) Jaffa: a city that is thousands of years old which has been inhabited by Caananites, Turks, Arabs, British and Jews of course! Why is it so clean and pretty? I can’t figure it out – except for the odd grubby street Jaffa(or Yafo) is in pretty good nick. This is a place that still has a lot of Arab residents and many of the Russian, Romanian, Moroccan and Lebanese restaurants are amazing. It’s only a few kilometres away from Tel Aviv and you can drive there in no time. 5) Neve Tzedek is a very happening area with Shabazi Street in the middle of all the action – this is the exciting and bohemian part of town that looks like a little village. Nana, the restaurant I mentioned is right here off Shabazi. This is the street to buy fine jewellery – often custom made like the famous Agas & Tamar; trendy Judaica items such as hand made seder plates or a cool menorah and handmade clothes. There are ice cream places and a Japanese restaurant too. My friends took me to Cafe Nina, which is beautiful, as are a lot of places on this street – they are so old and lovely. 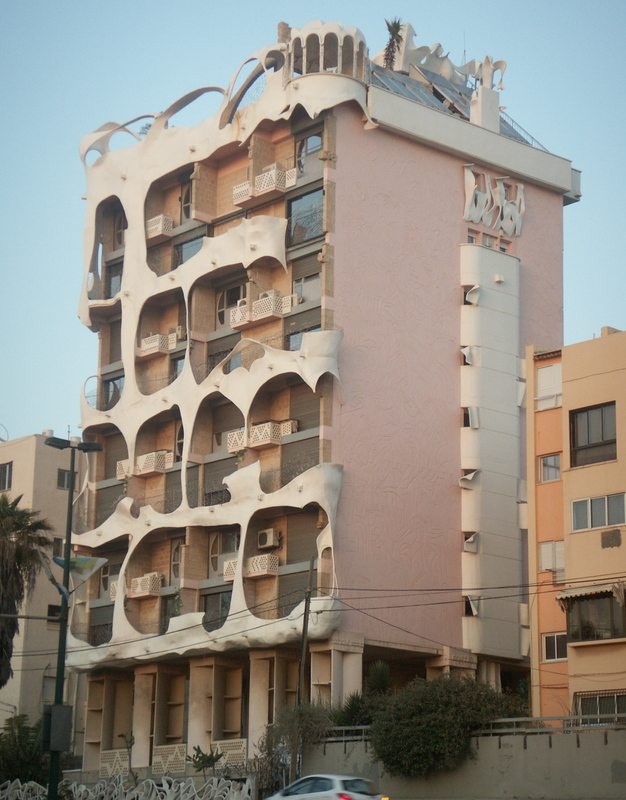 Israelis seems to have a love for Bauhaus and Missionary Villa- style architecture. Close to Neve Tzedek is Rehov Dizengoff : a very cool street and has been such since the 1930’s. It’s lovely, leafy green and full of very hip shops, cafes, bars, a cinema, a fountain and a shopping mall. A lot of the long term residents lament the decision to build the Dizengoff Centre as it changed the the boutique-and-cafe ambience of the street, I do admit it doesn’t have the same charisma as Shabazi Street but I think the character still there – it’s better than any major shopping area of Sydney or London which is almost entirely chain stores. At least Dizengoff’s not a Starbucks-and-Krispy Kreme territory , which, by the way, is a really creepy and inappropriate name for a doughnut shop. How did it ever take off? No self-respecting Israeli would bother going to such a place when the world’s best doughtnuts, the sufganiyot, is available at the local bakery. The Cafe Michal is my favourite on this street – at 230 Dizengoff – nice atmosphere, nice bathrooms! 1) Just watching the IDF on the streets (and at the airport! 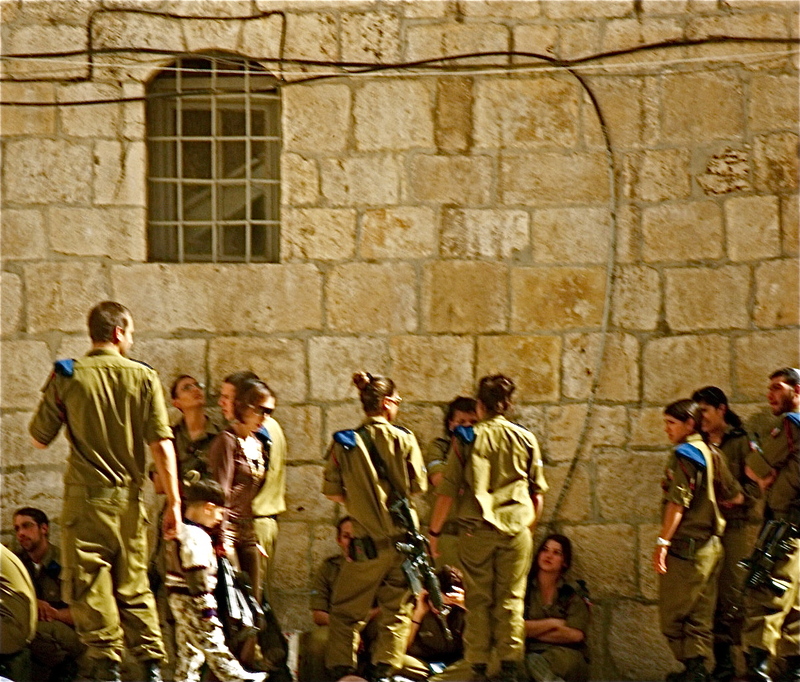 Goodness, what an harrowing experience that was) now gives a pacifist like me the creeps and for those of us who have been to Palestine and seen them in action, one may wonder why it’s called a “defense” force. How can you expect to put every 18 year old up for compulsory service doing the dirtiest of all military activities and expect them to turn out as respectable world citizens? Poor things. They don’t stand much of a chance. Little kids and their big guns. As this clever lad puts it – it’s not about security, it’s about discrimination. The institutionalised bigotry and descrimination is evident in everyday life. A great example is the ID cards. I actually didn’t believe that the ID cards listed a person’s race/religion as late as 2004 or 2005. These days stating one’s Nationality on the ID is optional. the “Nationality” categories look something like this: Arab, Druze, Canadian or Jew – Nationality indeed! There is no such nation as Arabland, is there? These little colour-coded cards will determine where you live, where you work and where (and IF) you can get married. That’s right: you see, there is no civil marriage in Israel, which means that if you are not Jewish or you wish to marry someone who isn’t a Jew – or maybe they are not “Jewish” enough – then you may not get married in your own country. As you see, racial and religious profiling is as obvious as a slap in the face. I thought we got rid of Nazism for good. I’d love to see, as a spectator from the outside, what would happen if 20% of the French or Australian citizens were subject to such legal restrictions and humiliation because they were of the “wrong” religion or race. There would be blood. And riots… or, more likely, it just wouldn’t happen at all. Fortunately, things are evolving. There is racism everywhere but it shouldn’t be legalised. It’s hard to keep politics out of your trip to Israel, if at all. I do find it best not to discuss such topics in public. 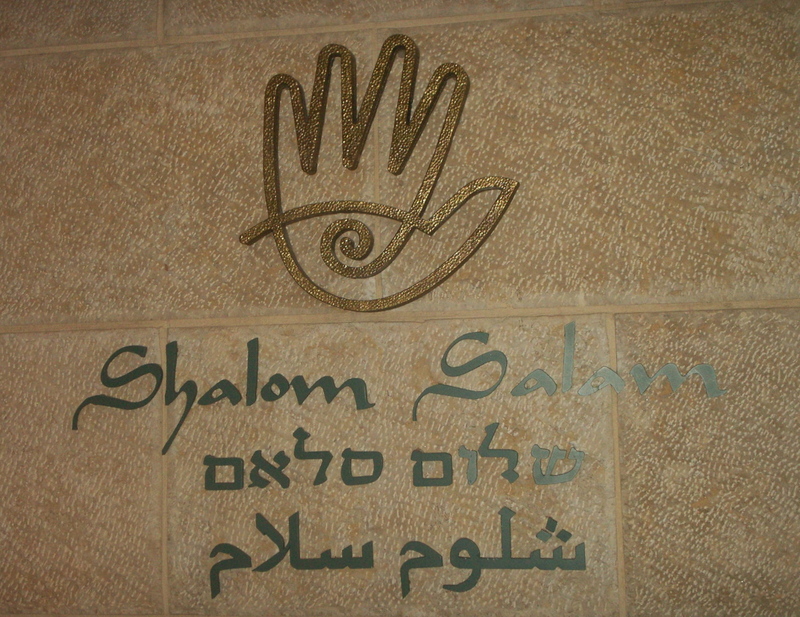 For peace in The Holy Land one day: let’s keep praying! 3) Jewish Holidays in Israel can be such fun, especially Purim and Hanukkah, but for those of you who aren’t devout Jew or if you are interested in indulging in Israel’s many tourist persuits, I recommend you check the Jewish calendar before you book your trip. Check what the holidays are and whether or not they are public holidays. EVERYTHING shuts on some of the holidays. They can go on for several days. If you have friends in Israel it may be a good time to visit if they offer to let you join in their family activities. 5) Driving in Tel Aviv is an absolute nightmare. It’s not only that they have the cheek to drive on the wrong side of the road like in America (Bah!) 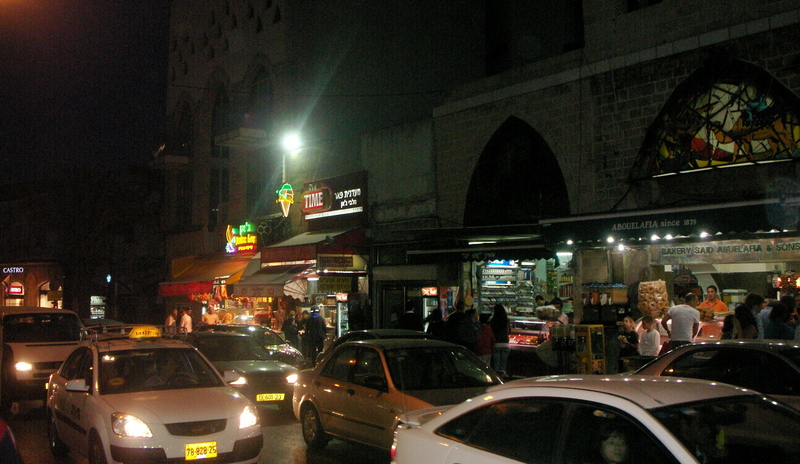 but the congestion, driving on the pavement and road rage was all a bit too much for my stomach – there seemed to be a lot of beeping and people on scooters banging on the window of my friend’s cars and screaming…something rude in Hebrew. Israelis aren’t always the easiest people in the world to love if they are behind the wheel of a car. Especially if you’re on the roads in Tel Aviv. Thankfully, the taxis are pretty good and pretty cheap. Buses are reliable but often quite crammed. Walking is still free. So… if you can forgive Tel Aviv for the “bads”, you will absolutely love the “goods” but I will say: Israel isn’t for everyone. One more thing to note for any traveller to Israel: about 1/3 of the countries I’ve visited won’t admit tourists carrying Israeli passports or even israeli visa stamps in their otherwise acceptable passports. You may have trouble in Indonesia, Malaysia, UAE, Saudi Arabia, Lebanon, Syria, Iraq, Iran, Gulf Countries. There are certainly others as well. it doesn’t always happen (except in Lebanon and Syria, where my passport was poured over by officials to check for Israeli stamps) I know, for example that the UAE don’t seem to care about my Israel stamps. It just as well, really : if try to make me choose between Exquisite Israel and Plastic Dubai guess who is going to lose?! As scary as they are on the road and as tough as they, Israelis are very accommodating, fun people. You won’t walk away without a new friend. Even after driving with my Israeli friends, I still love them most of the time. A lot of my friends there have had a tough time in the last few years and they are just amazing people, I am so lucky to have them. It’s not one of those easy destinations to visit but, for me, I wouldn’t have missed out on my trips to Tel Aviv for anything. I’ll be back soon, Israel. I know you miss me too.